The first, a Magnitude 5.7, which occurred at approximately 7:01 am, with preliminary coordinates as 58.84 degrees longitude, and 13.93 degrees latitude, with a depth of 10 km; and another of Magnitude 6.4 which occurred at approximately 11:16 am on Thursday, 16 July 2015. The preliminary coordinates for the second quake are given as 58.87 degrees longitude, and 13.96 degrees latitude, with a depth of 10 km. 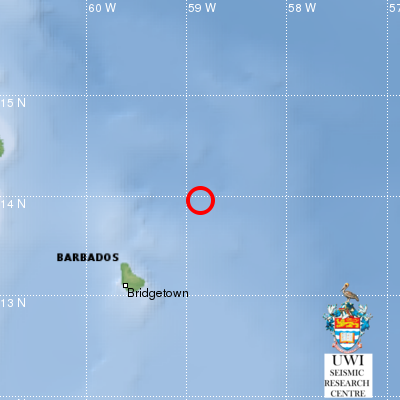 This puts both quakes at approximately 125 km North-East of Bridgetown, Barbados. A third earthquake Magnitude 5.3, which occurred at approximately 11:36 am, with preliminary coordinates as 13.90 degrees latitude and 58.63 degrees longitude, with a depth of 10 km. This puts the quake at approximately 140 km North-East of Bridgetown, Barbados. 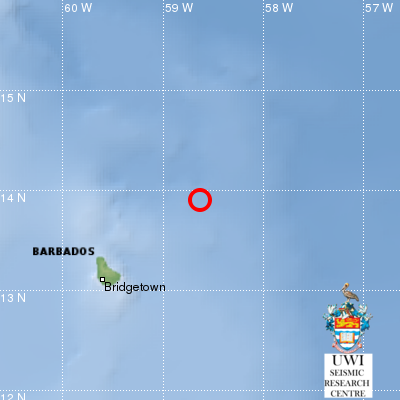 Residents to the North of Grenada and Carriacou reported feeling the quakes, but there have been no reports of damage. NaDMA will continue to monitor the situation and provide any updates that are necessary. NaDMA urges the population to continue to be vigilant and prepared for all hazards, both natural and human-induced.